Country’s largest teaching union draws up guidelines to help 'poverty-proof' classrooms. Child poverty in Scotland is now so severe that teachers are being sent advice on how to spot if a child in their class is going hungry, amid evidence that the problem is having an increasingly serious impact on education. The new guidance, which will be distributed to schools and colleges across Scotland next week, warns that the issue of hunger among pupils is “moving from the exceptional to the more commonplace” as families struggle to make ends meet. The advice has been drawn up by the Educational Institute of Scotland (EIS), the country’s largest teaching union, after a survey of 300 schools and colleges suggested that teachers are increasingly having to help underfed pupils. It is the first time that a section on hunger has been included in the guidance. Teachers who suspect that a child may be going hungry should include them in morning breakfast clubs and post the details of nearby food banks on school notice boards and websites, so their families can seek help, the guidance says. 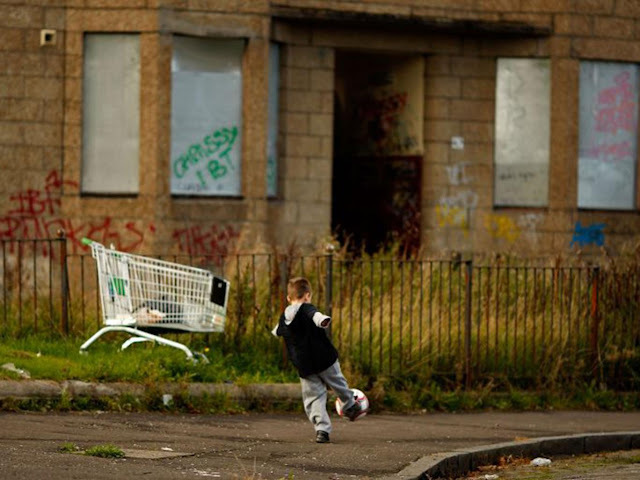 More than 222,000 children in Scotland are currently described as being in poverty, but the EIS warned that the number would rise if the Government’s “austerity agenda” continued. “Schools and colleges are part of society, and so are not immune from the problems of that wider society,” said the union’s general secretary Larry Flanagan. The EIS said the aim of the new guidance was to give practical advice to teachers, allowing them to “poverty-proof” their classrooms. The 20-page booklet, entitled Face up to Child Poverty, also offers advice on school uniforms, field trips, homework and class equipment – all of which can be problematic for impoverished children and their families. Some pupils may have “no option” but to wear the wrong type of clothes to school if their parents cannot afford the correct items – and may not feel comfortable telling their teachers why they broke the rules, it says. Schools are also advised to ensure uniforms are as inexpensive as possible and set up clothes exchanges. Iain Gray, Scottish Labour’s opportunity spokesperson, said the new guidance painted a “damning picture” of the impact of poverty on schools. “In a well off 21st century country some of these findings are shameful, but they will not surprise anyone who deals on a day to day basis with the growth of food banks and the impact of the Tory government’s welfare reforms,” he added.